Owing to the sprawling infrastructure facility, we have been able to offer the clients Skinning & Lining Extruder Machine. These are manufactured using advanced machines and production techniques in our premises. Our offered products widely find their applicability in various cable and wire industry. These are widely acclaimed in the market for their reliable performance, low maintenance, resistance to corrosion, sturdy construction and long service life. These 30mm Cable Extruder for Lining are used in extrusion lines for fine wires with highly expanded insulation. Our range of Skinning & Lining Extruder Machine is available in different specifications as per the needs and requirements of our clients. 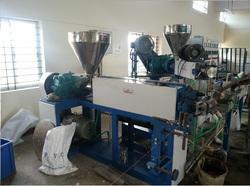 Our machines are used in Extrusion Lines for Fine Wires with Highly Expanded Insulation. We offer these products in a competitive price range. Looking for Skinning & Lining Extruder Machine ?